As much as I love all things whisk(e)y, I’m still dipping my toes in the peaty waters of scotch and scotch cocktails. One of my recent favorites is the classic Blood & Sand. Composed of equal parts blended scotch, Heering cherry, orange juice and sweet vermouth, the drink is surprisingly smooth and sensuous. This tipple first appears on the radar in Henry Craddock’s 1930 The Savoy Cocktail Book. Its name is most likely derived from the 1922 movie that starred Rudolph Valentino, but its history is otherwise unknown. More recently, its revival was almost halted by its ingredient list. In fact, master bartender Dale DeGroff rediscovered the recipe in the mid-1990s and was so intrigued by the combination that he both doubted its value and had to try one. Though the ingredients might seem incompatible at first glance, the result is a rich, almost-tropical-punch drink. Rich cherry liqueur adds weight, sweetness and velvety texture that’s balanced by the orange juice’s acidity. The scotch gives the drink the smoky, peaty notes that are grounded by the rich wine-y-ness of the sweet vermouth. On paper, it appears of be a cacophony of tastes, but in reality, it all comes together for a right, delicious experience. Combine ingredients in a cocktail shaker and shake until well-mixed, about 13-17 seconds. Strain into a chilled coupe glass and serve. Is Famous Grouse good Scotch? I see it at ABC a lot. It’s our well scotch — it’s good for mixing, but I wouldn’t necessarily sip it alone. I agree though if you can find the Peatier (is that a word?) Black Grouse it’s really worth a shot. 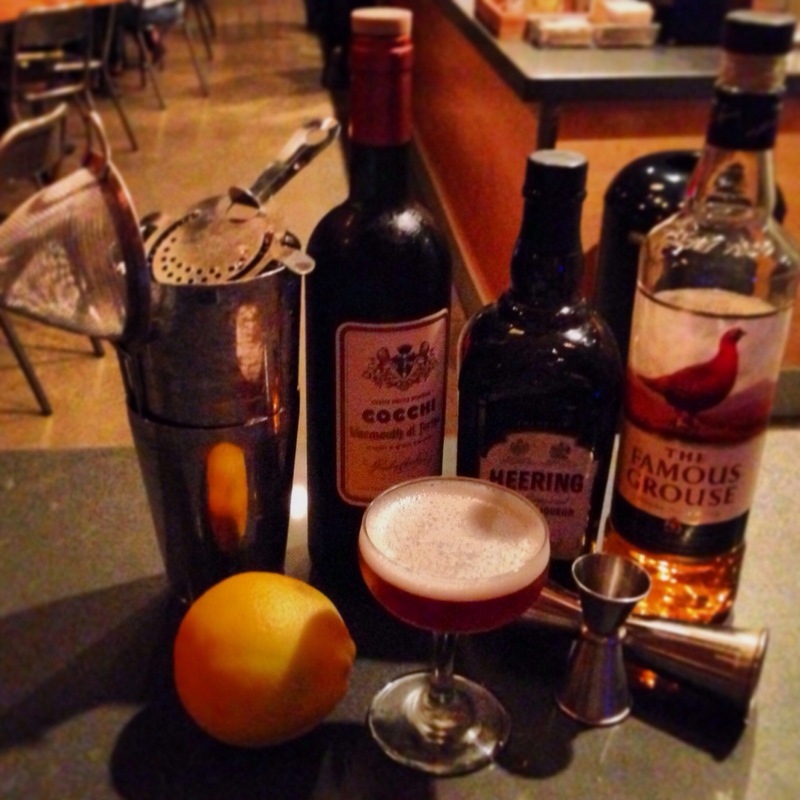 I love making London Sour’s with that scotch. Love this drink, we tried it with the Cathead Pecan because of it’s meaty smokiness and it turned out a little to sweet, Perhaps if we had used Kirsch instead of Herring or dry vermouth instead of sweet. As much as I love a Blood and Sand when it comes to classic scotch cocktails I think I’ll always be a Rob Roy guy. Then again why choose I have two hands. Hmmm. That sounds interesting, to be sure, but I think I’ll stick to the scotch-based recipe! What else would two hands be for?